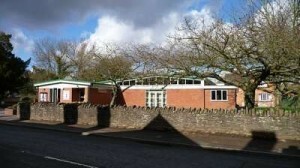 A great venue for family, business and community group activities and events, licensed for music, films and shows and for the sale of alcohol at an event. Bosbury Parish Hall is conveniently situated in the heart of the village with its own private car park. The main hall is 11 metres by 11 metres with a woodblock floor suitable for dancing and exercising. 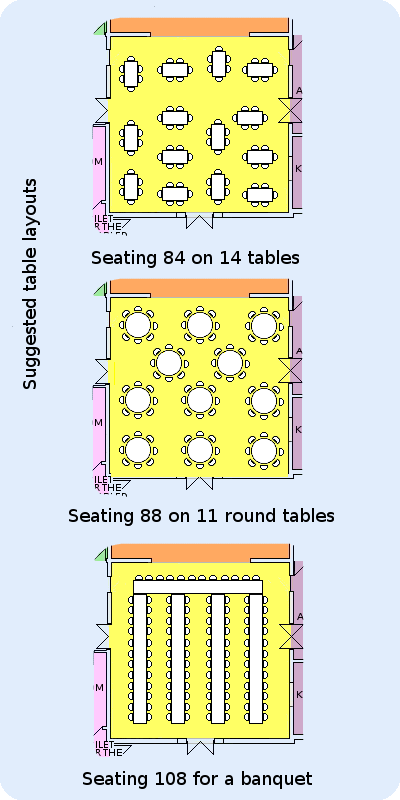 It is equipped with 106 chairs and 14 rectangular tables that will each seat six people. This area can be used for conferences, lectures, group meetings, sales, exhibitions, parties, wedding receptions, all types of family celebration as well as small scale indoor sports such as table tennis, short tennis and short mat bowls. There is a permanent cinema screen installed and projection equipment available. The white wooden ceiling gives an airy feeling and great acoustics and the dimmable wall lighting adds extra atmosphere after dark. The Founders Room is a smaller room beside the entrance foyer which will seat up to 30 in a meeting layout but is also useful for discussion groups or as a changing room for fashion shows and theatre productions. For smaller events the hall has a modern well-equipped kitchen fitted out with commercial catering equipment including an oven which can hold four catering trays, a four-ring hob, dishwasher, hot cupboard stainless steel working surfaces and a shuttered serving hatch opening through to the Main Hall. For larger events there are caterers in Ledbury who are familiar with our facilities or users may bring in their own caterers. There are modern toilet facilities with coat-hooks in the lobby and a separate toilet equipped for the disabled and accessed from inside and also from outside by a RADAR key. It also includes a nappy changing unit. 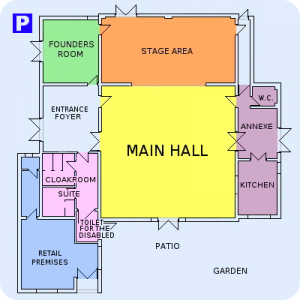 The stage area is level with the main hall floor and runs the full width of the hall. It is 5.25m deep and is connected to the Founders Room giving back stage changing facities or a preparation area. There are rear doors at stage right and stage left. There is wooden staging on steel framed supports available. Stage lighting, with gels and dimmers, is available. The layout is suitable for film shows, discos, drama, presentations and talks. The Hall is available for hire from 8.00 am to 11.30 pm daily, including weekends. It is licensed for up to 200 people to attend an event (and Fire Safety Authority approved). Our premises licence allows for live and recorded music and dancing with an extension to 1.00 am and for the sale of alcohol for consumption on the premises. Our Management Committee members are available to help with advice on using the Hall. Their details are given on the Notice Board in the Foyer and they all live in Bosbury. In the first instance our Booking Secretary will be able to answer most queries and can arrange for you to view the Hall. You are also welcome to email the Hall Secretary on bookings@bosburyparishhall.org for any further information. The Hall has a 9ft by 12ft wide pull-down cinema screen in the main Hall. 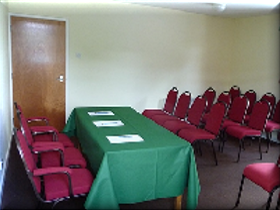 There is also a laptop, HD projector and remote available for hire and set up for film, photographic slideshow or Powerpoint presentations. Please contact the Booking Secretary to confirm arrangements for use of this facility. 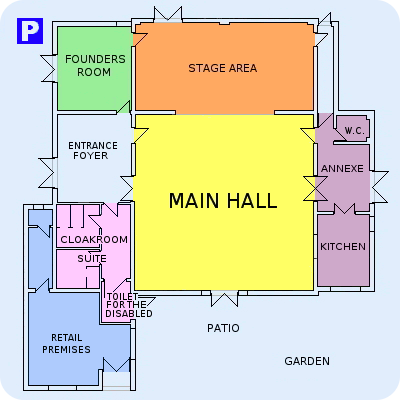 When you are planning the length of time you will be at the Hall, do allow for the time it takes to set up beforehand and to clear away at the end. As part of our hiring conditions, we do ask that you clear up and remove all waste paper and kitchen waste and leave the building clean and tidy. This does take a some time and may involve coming in the following morning after an evening event. Our modern well-equipped kitchen is fitted out with commercial catering equipment including an electric oven which can hold four catering trays, a four-ring electric hob, extractor fan, dishwasher, hot cupboard, refrigerator, 25-litre water boiler, stainless steel working surfaces and a shuttered serving hatch opening through to the Main Hall. It is straightforward for you to arrange your own food and drink and use all the kitchen facilities. In addition we have 120 sets of crockery and cutlery as well as tea cups, saucers and spoons for use at the Hall and available for outside hire at a modest charge. Here is a PDF document showing our Terms of Hire. Glasses are usually available from the supermarket or wine merchant that supplies your drinks. For larger events we have contacts with a number of local caterers including: Vine House Catering, New Street, Ledbury. 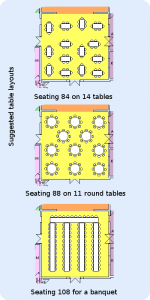 To give you an idea of the size of event we can accommodate, here are some possible table layouts. The first uses our own tables, the second will require hiring in round tables and the third needs 11 extra tables hired in to supplement the ones we can provide. We have used Hampton Hire Ltd in Hereford for table hire. Cakes for Special Occasions from Special Ice in Ledbury. Inflatables from Number One Bouncy Hire in Ledbury; call 01531 633332. Piano Hire from Vale Pianos in Pershore. Flowers from Floral Events in Malvern.